M.A. Recordings on vinyl. We are fortunate to be able to play our favorite music from many different media: straight from CD; ripped to hard disk: streaming from the interwebs in either Redbook format and lately increasing in higher resolution 24 bits; and more. In that department, Tidal now even offer MQA encoded albums that yield even higher resolution with appropriate decoding/unfolding facilities. We can even enhance the input from hard disk and streaming sources via HQPlayer resampled to DSD512, 512 x the sample rate of CD, provided our DAC can process it. With so many digital sources, capabilities and conveniences we still enjoy our vinyl storage. Here we select a pile of albums to play in a certain sequence and thus create our own little concert or festival. Selection is only part of the ritual. Next is assessing the cleanliness of the records. Many black discs in our collection were pressed a long time ago and have a history of being used and in some cases abused as well. Also, quite a few albums had previous owners not all of whom were as cautious about handling the precious stuff as they should have been. Fortunately a great deal of restoration can be done with a good record cleaner. Our Clear Audio Double Matrix does a great job. Either after being soaked, brushed and vacuumed or just after some 5 to 10 times of playing, a record also gets a degaussing treatment on the Furutech DeMag. Only then our private concert or festival begins. Call it crazy, call it mindfulness, call it a strange vegetable… we like it. All this foreplay can still end in disappointing limpness or hollowness when the record itself fell victim either to the loudness war or lousy pressing quality. Today, the only physical music carrier that sees sales increases is vinyl. Most current records include some sort of voucher for a free download of the same material. Mind you, that will be an MP3 rendition. As vinyl is so trendy, too many record companies fall for the quick buck and use the exact same master they used for the CD/digital copy – including its emasculating compression. See this website for an up-to-date overview of crowd-based dynamic range ratings. There are some for vinyl but we think those are incorrect. There are too many factors to influence the outcome of the TT meter used for the dynamic range measurements. Stylus, arm and electronics have a significant influence, much more than a pure digital measurement. The second pleasure killer is poor pressing quality. The cause can be the pressing plant using old machines, inferior vinyl or an old stamper. With the increase in vinyl demand, corners are cut but fortunately not everywhere. Enter Todd Garfinkle of M. A. Recordings. Todd always looks for exceptional quality. First is the music. He roams the world in search for extraordinary musicians who make extraordinary music. This can be on street corners, in subways or concert halls. Then he strikes a deal with the artists to record them. That is a one-off thing. No retakes, no slices, no dubs. The recording itself takes place in an extraordinary venue. That could be a church, abandoned monastery – anything that has a great natural acoustic. And yes, it might be a recording studio but only for the space. Once arranged, Todd opens his backpack and takes out his compact but high-quality recording gear. Over the years he tried and used many iterations of kit but a stable factor are his M.A. Recordings original DC-powered custom microphones designed by Junichi Yonetani with DPA mm0042 capsules. Another long-time standard are his Stax Lambda Signature Pro earspeakers. Cables vary between custom jobs from George Cardas, Crystal Cable or Marcel Croese. Digital recorders follow the market. They should be easy to carry and record at the highest sample and bit rates. The Fostex DV-40 DVD recorder, Korg MR-1000 and MR-2000 are just a few. M.A. Recordings offer many of their wonderful recordings in various formats ranging from CD through DVD to hi-res downloads and vinyl. Some of the music is an acquired taste. Apparently we already underwent that process long ago as so far we have liked most of Todd's productions. Hence he uses us as Dutch listening guinea pigs. Some time ago we received a vinyl sample of one of our favorite M.A. recordings, La Segunda by Será una Noche. This is a 176.4kHz deal mastered on a 5.6MHz DSD workstation. Our sample was a test pressing and Todd asked how we liked it. Unfortunately that pressing was not the cleanest and in our opinion carried too much groove noise. Extensive cleaning did not make it disappear. We have a reputation for emptying a demo room at a show when some of the music we carry along gets played. With this vinyl containing music which only few people know, we filled a room to capacity at a Dutch show. A bit later, Todd finally found a pressing plant to his liking. No surprise to us, it was our Dutch Record Industry known for dedication and superb craftsmanship in all steps of record pressings. The only problem? They are very much in demand. To get your records pressed, wait in line. 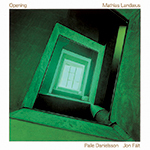 From this Dutch plant's output, we received Opening with Mathias Landæs on piano, Palle Danielson on bass and Jon Fält on drums. This is a 5.6MHz DSD recording from Todd's Korg MR-1000 and the trio played in front of two omni microphones in the large concert hall of the Swedish Radio studio. This vinyl was pressed on two 180-gram discs and cut at 45rpm on a Westrex cutting system by Bernie Grundman. We played this one straight from the sleeve without cleaning or any other pre-treatment. The pressing was as clean as can be and we noticed just one tick on one of the four sides. If you like Piano jazz trio, here's one for you. If you enjoy recorded realism, here's that, too. The Steinway has all its aspects intact and realistic size within the sonic illusion that extends from the loudspeakers in all three dimensions. The upright bass shows off its woodiness and body while the drum kit adds dynamics and plenty of moving air from its tom. We liked the height information that made the illusion very plausible. We stayed with a Steinway Grand but now the 1903 New York model D played by Ito Ema recorded in February 1994 by Todd in the Harmony Hall of Matsumoto in Japan. He used his then current setup of a pair of Brüel & Kjær 4006 microphones with a custom-built amp running Cardas and Furukawa cables and a Studer A-820 using 2M 996 tape at 30ips/76cps. Monitoring was via Quad ESL-63 pro loudspeakers and Stax Omega earspeakers. This big analog setup was clearly from before Todd's digital backpack stage. The album is a 180-gram pressing cut at 33.3rpm. Ms. Ema goes through this collection of keyboard exercises by the great J.S. Bach known as the Goldberg Variations with all due respect and skill. Glenn Gould may have popularized the Variations but this recording sounds more accurate to the time of composer. We're guessing of course as no one alive has heard the master himself play the harpsichord. The piano is a much later invention. Just like the Opening album, this pressing was dead quiet. Next came Transcending Continents & Memories. Christophe Deslignes is on organetto, Peiju Lien pipa, Jean-Lou Descamps regular and Norwegian Hardingfele fiddle, Thierry Gomar vibraphone and percussion. The recording used a Marcel Croese modified Korg MR-2000 in a church of French village Nevian. The music is very M.A. 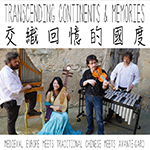 as it brings the Chinese pipa to a Baroque pump organ with pipes plus crosses the 8-stringed Norwegian fiddle with a modern-day vibraphone. From the digital master, Bernie Grundman cut the lacquers on his Scully lathe with a Westrex cutting head. From there the lacquers went to New Jersey for plating. Now the metal masters were sent to the Netherlands where Record Industries pressed the vinyl. The unexpected combination of instruments and musical backgrounds of the individual musicians blend wonderfully in the beautiful ambiance of the old church. For those who might be a bit skeptic about the pipa and wrongly associate it with background music in a Chinese restaurant, this album should be a real eye opener. Needless to say that this 33.3rpm album was again dead quiet in both grooves and even the transition into the dead wax was. For us this production was on par with the Será una Noche and Segunda albums. The Chinese lute is a 4-stringed plucked instrument which may be played with glissando, pizzicato and vibrato. Unlike violin techniques, the pipa also includes string bending. Peiju Lien is a master and on the M.A Recordings Whisper Highlights goes it solo. This 45rpm album on 180-gram vinyl was captivating on both sides and all 5 tracks. Needless to say the pressing was a good as it gets; again. Our favorite M.A. 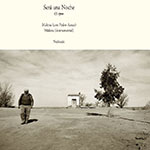 Recordings issue is the first Será una Noche. For that Todd issued the 24/96 master as a silver CD, a green version and a hi-res download. Now he added a 3-track extract on vinyl. The digital recording was converted to analog and masterfully cut to 45rpm on a Scully lathe by Len Horowitz. We received the red vinyl edition (there is a black version also). Maybe this pressing was not as quiet as the other samples but this recording was the most dynamic of them all. Vinyl is said to have a dynamic range of some 60dB compared to the theoretical 96dB of CD. However, our duo of Zu subwoofers had the time of their life with the 11-minute track "Nublado". The percussion of Santiago Vazquez made it so. It and the bandoneon of Gabriel Rivano in combination with Marcelo Moguilevky's bass clarinet play a melody that does not only stay in your head but heart. Of course Grabriel Kirschenbaum on guitar, Martin Iannaconne on cello and vocalist Pedro Aznar play their parts too on the other tracks. We congratulate Todd for his deal with Record Industry and hope to hear a lot more new music on vinyl. If you're into turntablesl and like to educate yourself in new music and musical styles, check out www.marecordings.com and their vinyl section.